With a catchy title of ‘Your Legacy Begins Today’ I was interested in what Fortuna from Perfect World had to offer. Set in Europe, during the golden age, the player has to take a side with one of the three available noble families. As a big fan of the Italian families, I chose to go for the Medici to capitalize on a legacy of great thinkers from their region like Michelangelo, Leonardo da Vinci and Galileo. Take control of your own army, develop them into a big empire and form alliances to gain more power. That’s the name of the game! When you first see your empire it looks rather empty and dull. You’ll have to start from the ground up. From hiring people, to building up the necessary buildings, you will have to do everything manually by yourself. 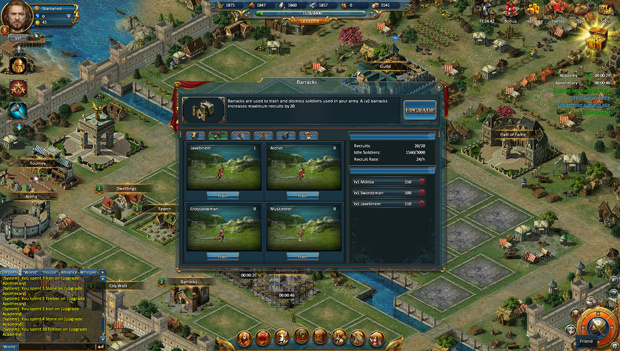 Each player gets a large capital city. Here you will have to place buildings within designated squares. Unfortunately you cannot go wild and place your buildings around to create unique designs as the spots are static. In the campaign, you will have to go through a questline together with your hired general. Each time you win a fight, you will move up a spot and you will face a tougher battle. Unfortunately the fighting is completely automatic, and the player has no control whatsoever over his troops. This feels like a missed opportunity in the gameplay department. The generals that you can hire however are able to utilize skills, and these will activate automatically as well. The bulk of the tactics comes in the form of finding generals with the right set of skills to best supplement your army’s strengths. The process of building your army is where Fortuna shines and allows you a sense of individualism from other players. 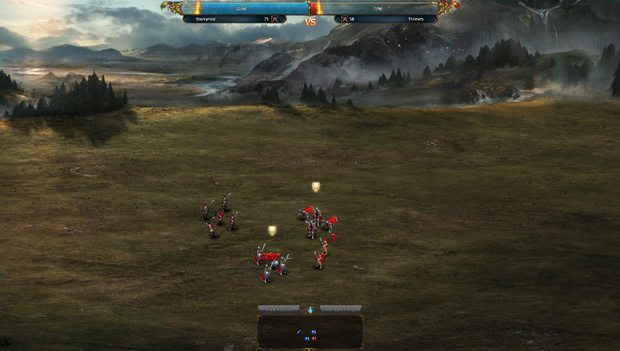 In the tutorial you are taught how to use your army, and how to deploy them. The deployment of your troops is important, if you specialize yourself with ranged units, you obviously don’t want them to stand at the front. Then you need to find the right balance of tanky front line units to protect your ranged dps, which of course can vary from battle to battle. Your heroes can also influence the strength of your units, and because every hero specializes in certain attributes, you really want to play around and experiment to see what works best. Your heroes can also receive training without having to endanger them on the battlefield. In the training halls, your heroes can farm experience while you do others things; it’s like bringing your kids to school. And if you want to make your kids even happier, you can dress them up with special equipment that makes them even better in combat. And slowly but surely you will see your empire increase. Buildings will rise and your rag tag group of marauders will grow into a hardened specialized fighting force built around your tactics. You remember the city you had when you started? It’s now a bustling metropolis with animated people going about their daily business. Of course the impatient player can use cards and throw money at your screen to make the building or training of units speed up. These time saving features are the limit to what cash shopping can get you though as every unit and building can be acquired without spending a dime. Just don’t underestimate the power that those speed boosts can offer. You are even able to buy resources and this can definitely give you an edge over people that do not pay. Fortuna is one of those real time strategy games that is a lot of fun, has a nice background story to offer, but unfortunately feels like it’s missing something from being perfect. While building up your empire is fun and creating your army’s legacy is quite entertaining, the game overall lacks in the features department. Though I’m more of an action gamer so Fortuna likely appeals more to those who prefer to spend time strategizing and arranging formations rather than controlling combat in realtime. Leveling up your units and building more buildings offers the RPG addiction for a while, but I look forward to seeing if Fortuna can up the ante in future updates.